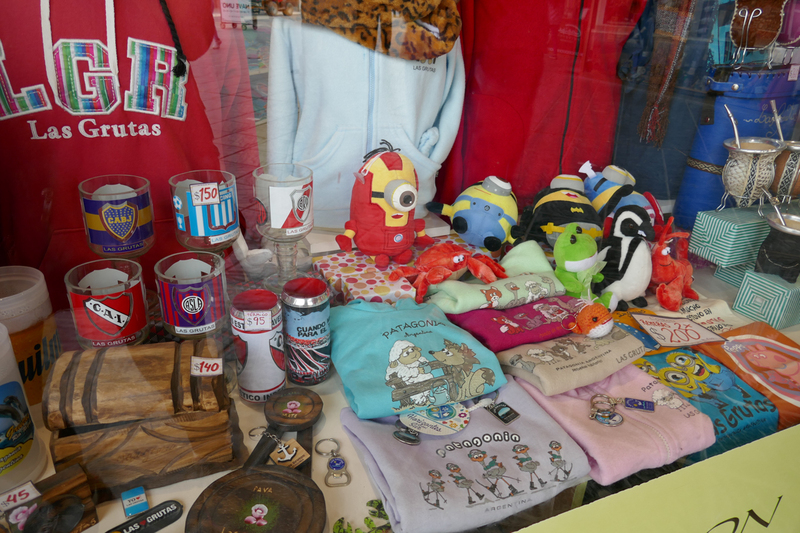 Parrots and Penguins and Whales, Oh My! (Península Valdés, Argentina) - Live. Travel. Play. 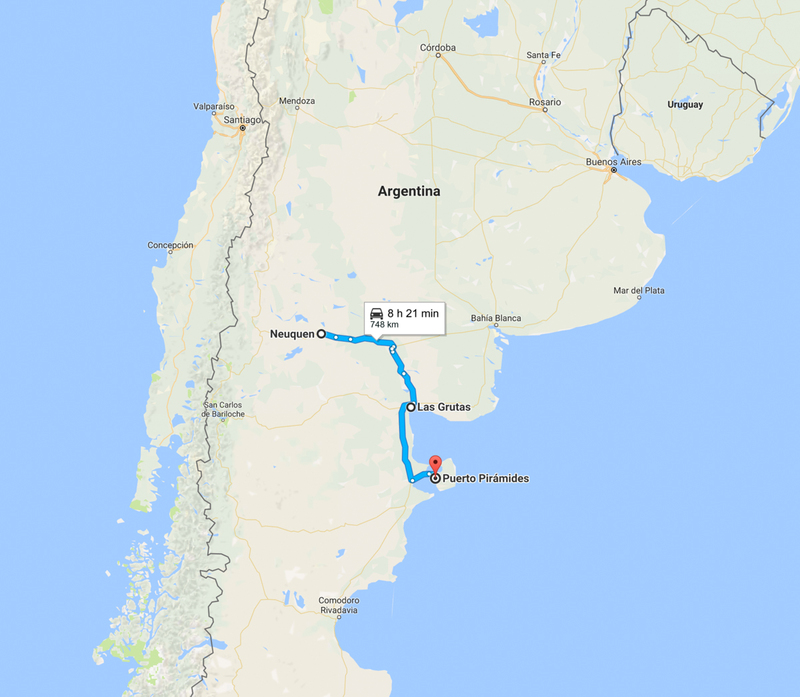 Gregor and I carefully timed our drive across Argentina so that we could be on the Atlantic Coast during the month of October. 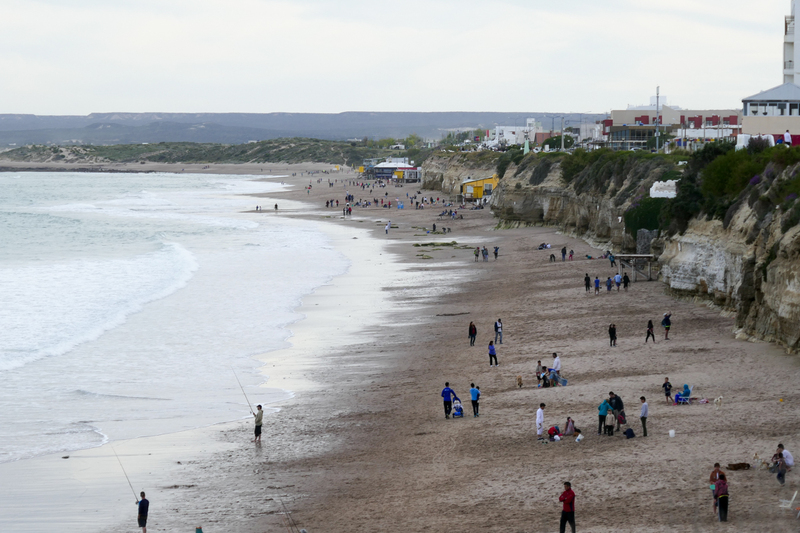 That’s the month when migrating Southern Right Whales arrive in peak numbers on the shores of Península Valdés. 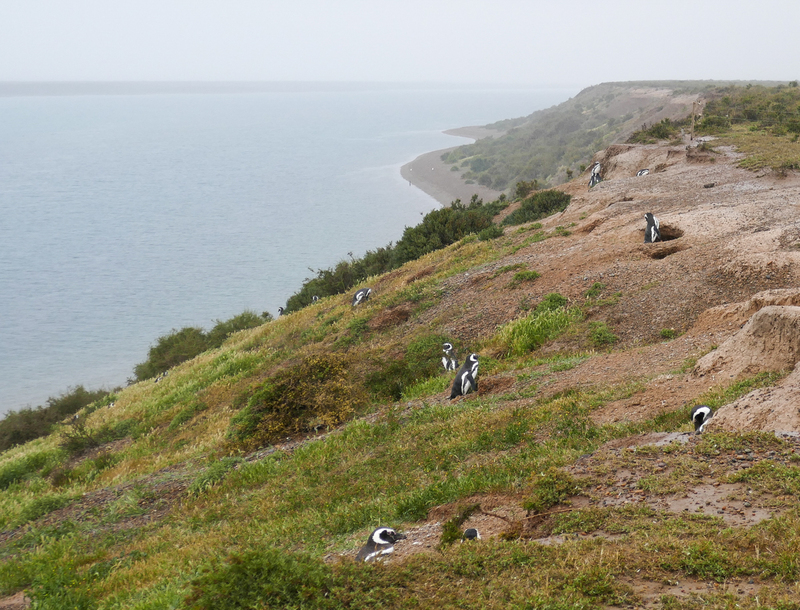 It’s also the time when Magellanic penguins mate at the rookeries along Argentina’s coast. Having been land-locked for a month, we were looking forward to seeing the ocean again. 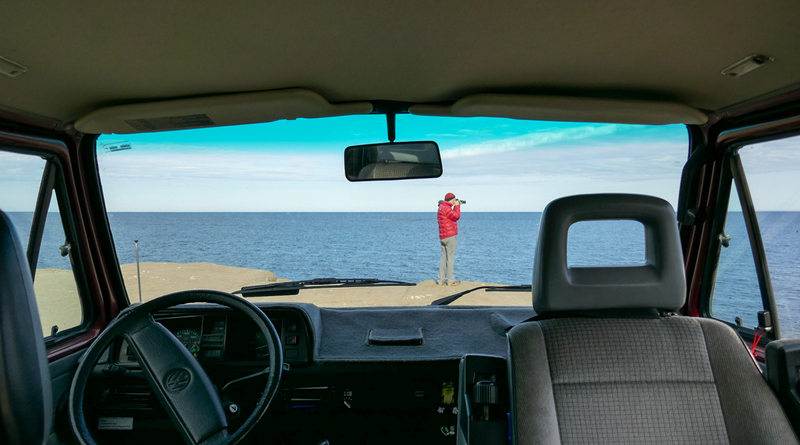 The plan was to go whale-watching and penguin-touring along the Atlantic coast with our American friends, John and Paula (Our Bigger Picture). 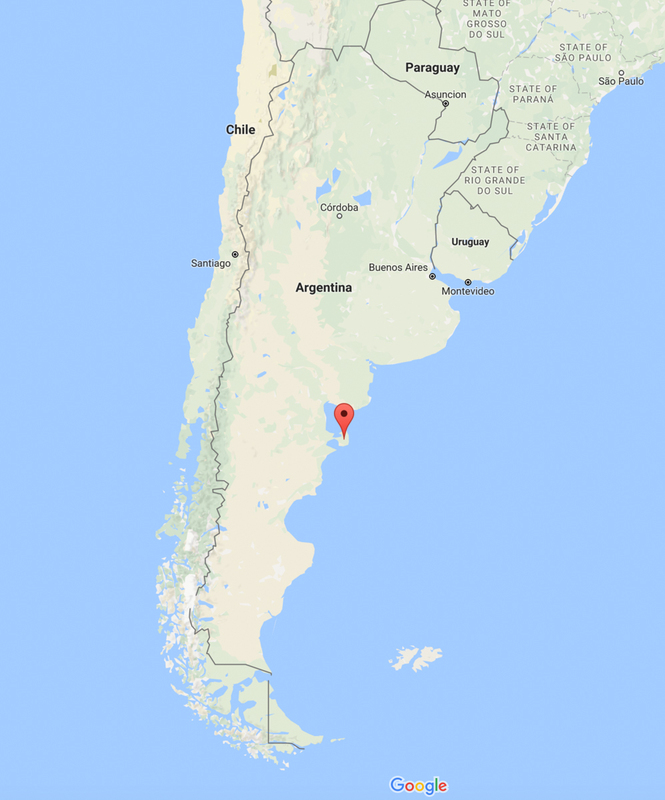 Since we were driving from Neuquén and they were driving from Buenos Aires, we decided to meet in the beach town of Las Grutas and convoy to Puerto Pirámides together. October is early spring in the southern hemisphere, so it’s not really warm. It’s more like sweater-weather. 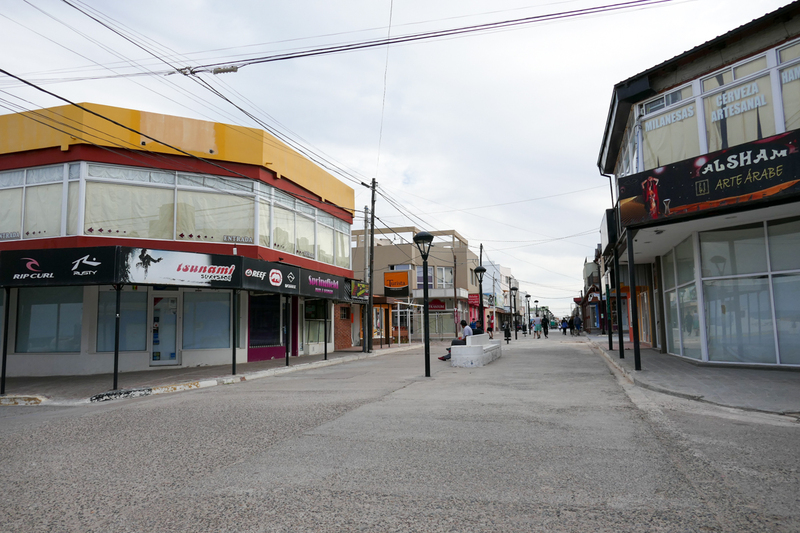 Las Grutas looked like it would make a nice beach destination in the summer, but with the colder spring temperatures it was kind of dead in town. 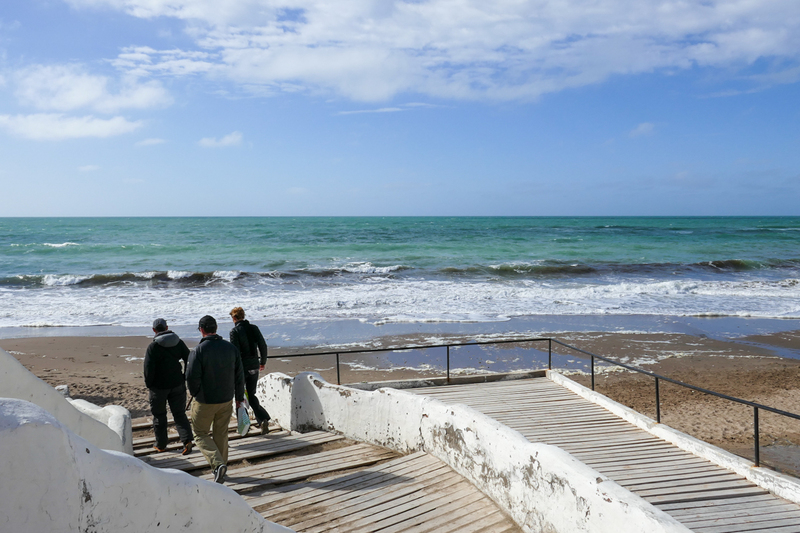 The morning after John and Paula arrived in Las Grutas, we all went for a walk along the beach. 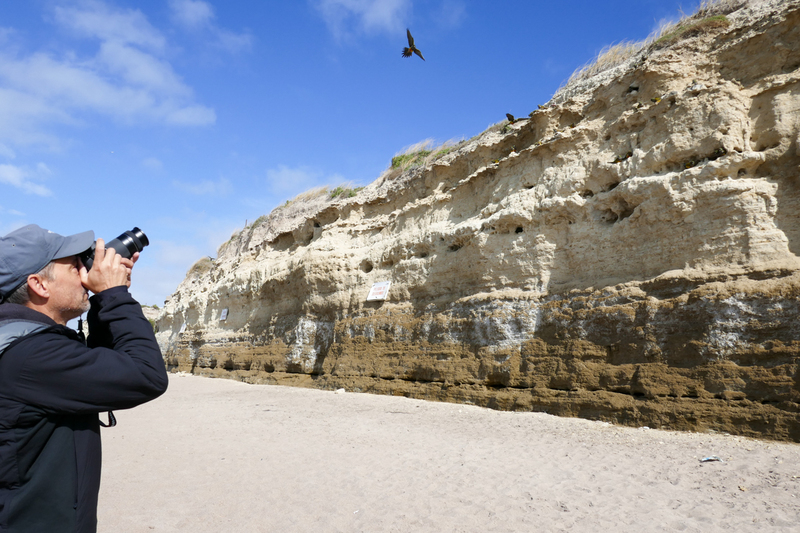 Gregor decided to bring along his new digital SLR camera so that he could practice his photography skills. He normally doesn’t carry a camera around (I’m usually the photographer), but he definitely picked a good day to practice. 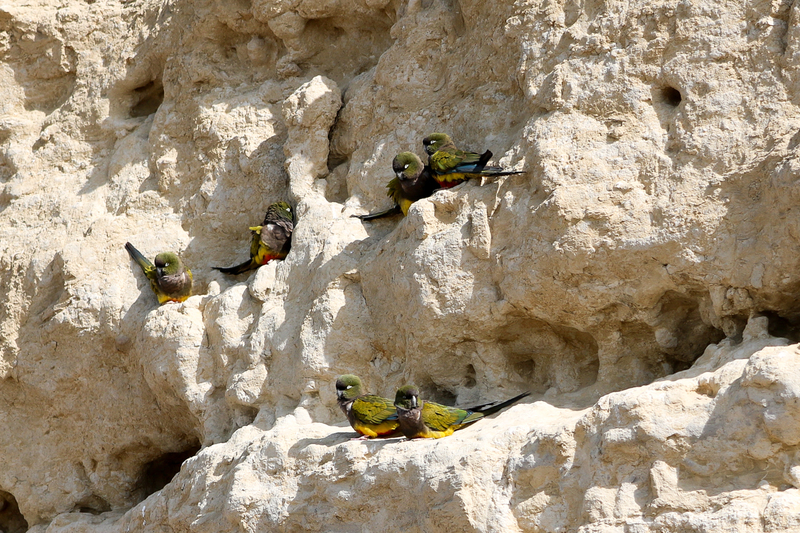 Gregor took some great shots of the parrots living in the sandy cliffs along the beach. 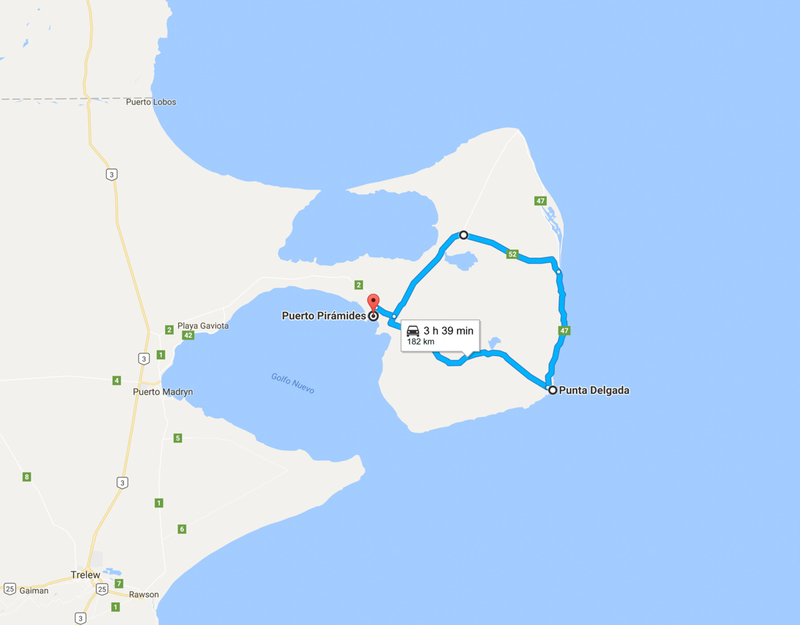 We stayed at Las Grutas for longer than expected (four days) so that Gregor could put in his two weekly work days and do some routine maintenance on Lucky. That’s been Gregor’s road life lately…when he isn’t working on his computer or on the van, he’s driving. This means that he actually doesn’t get a lot of time to rest. 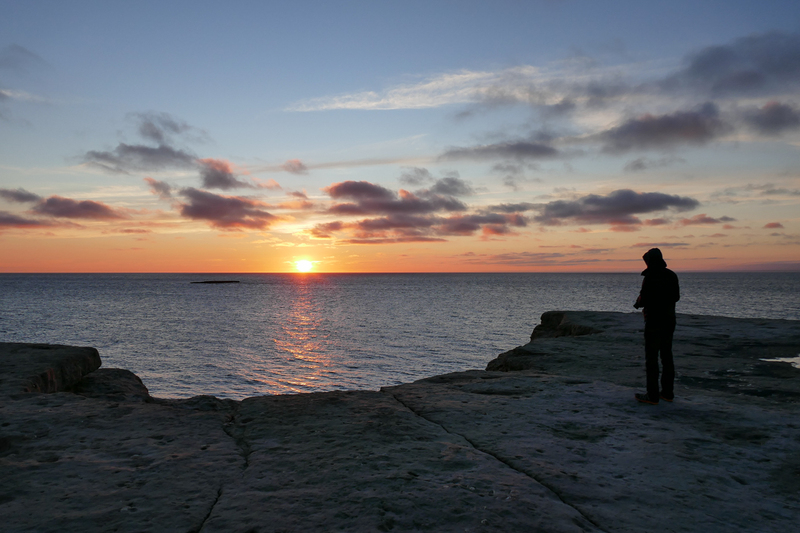 To prevent travel fatigue, we try to schedule consecutive days where we can be completely offline and spend time in nature. Our trip to Península Valdés gave us exactly what we needed. 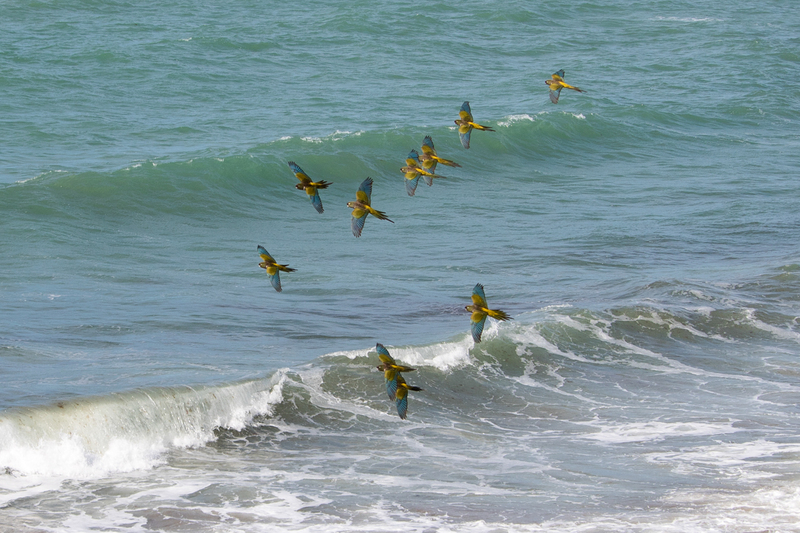 Península Valdés is a nature reserve and UNESCO World Heritage Site inhabited by a diverse range of marine wildlife, land mammals, and bird species. 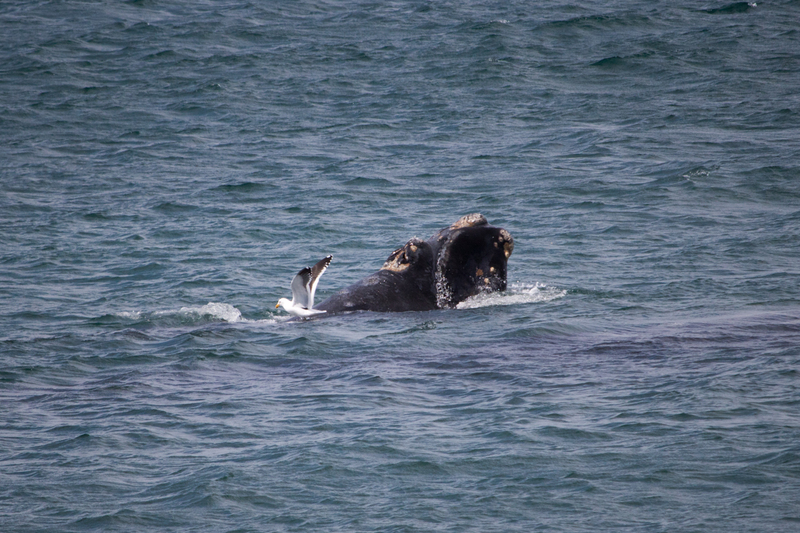 The main attraction on the peninsula is the endangered Southern Right Whale. 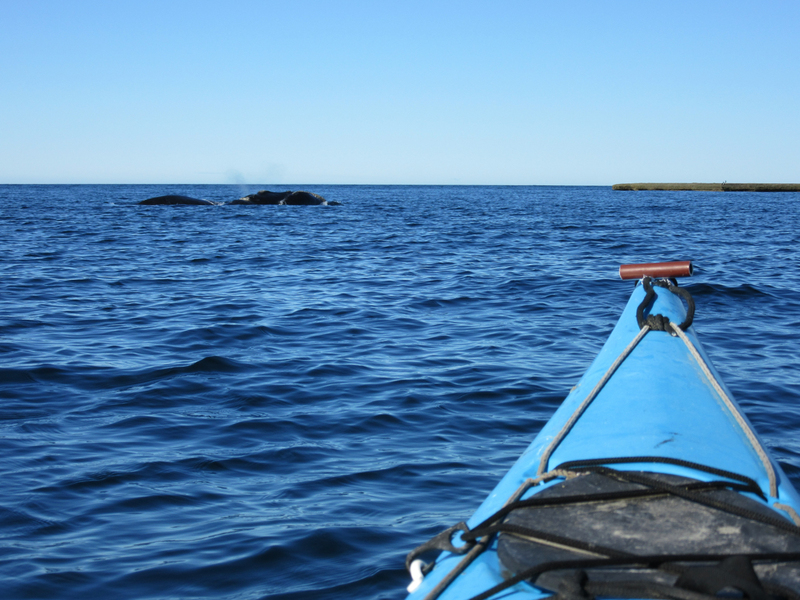 Each year between June and December, thousands of people flock to the peninsula to take whale-watching boat tours. 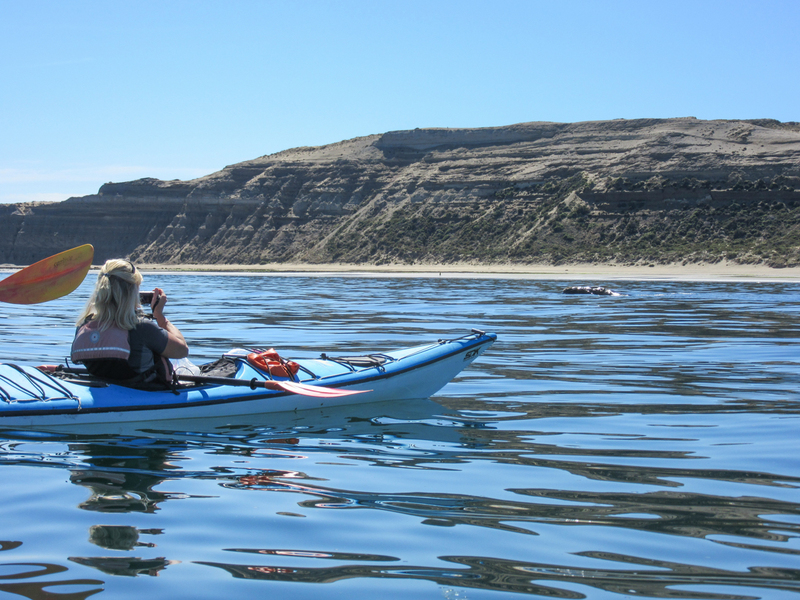 Paula booked all four of us into a sea-kayaking/whale-watching tour based out of Puerto Pirámides. 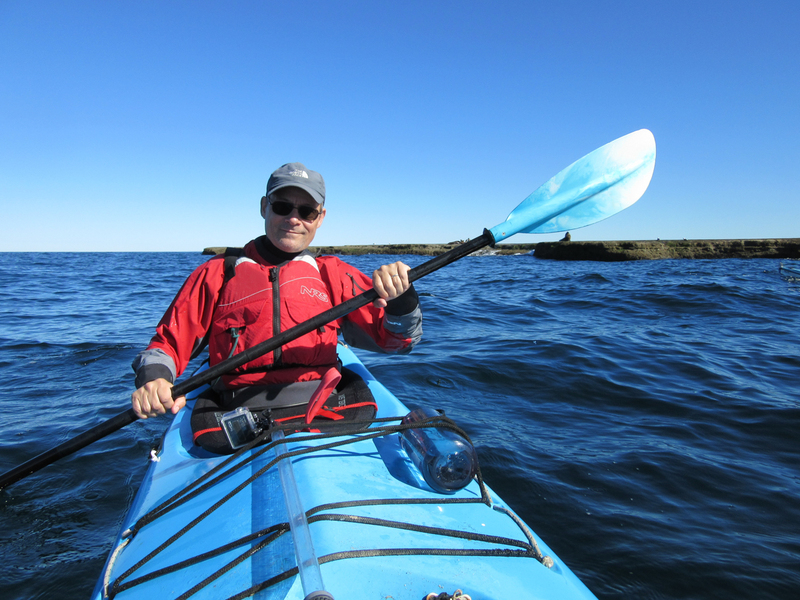 When we first arrived, the weather was incredibly windy and drizzly – miserable weather for kayaking. The weather reports showed that it had been like this for several days. 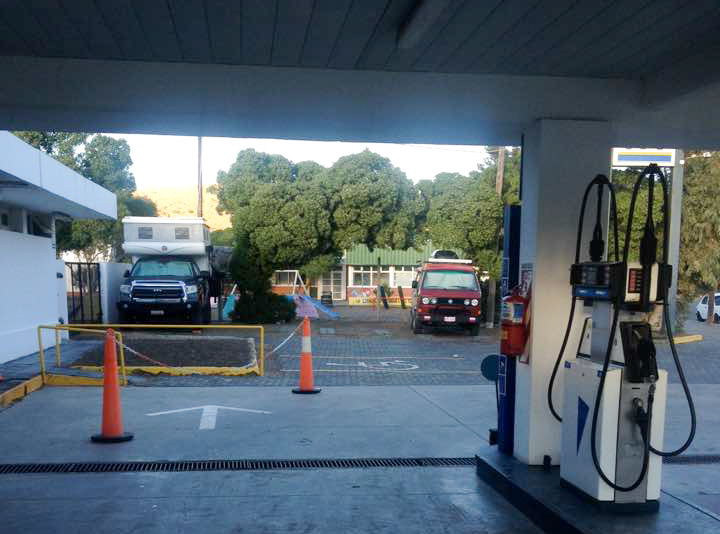 Since the municipal campground was closed, we decided to spend the night at the YPF gas station in Puerto Pirámides. The sheltered parking lot protected us from the raging wind and also provided easy access to washrooms (which was very good for me because I was on my period). By some miracle, the day of our kayaking excursion was calm and sunny. It was an excellent day. 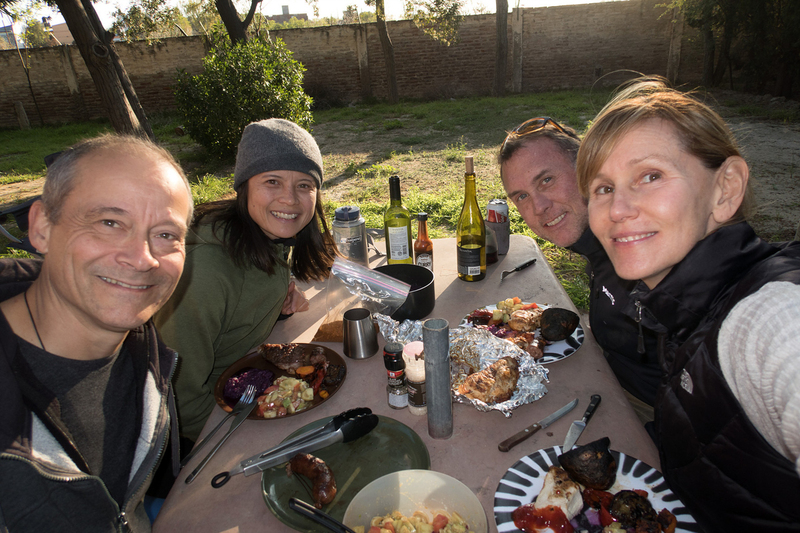 Our tour was run by Patagonia Explorers and we had two guides (Pablo and Eli) who led our group of six paddlers. 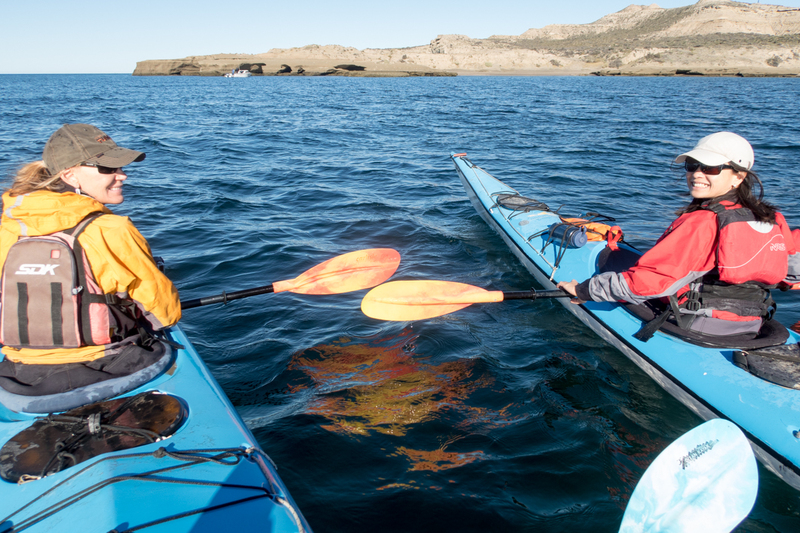 Gregor and I were impressed by our guides’ safety-conscious approach, their knowledge of the whales, and their respect for the natural environment. 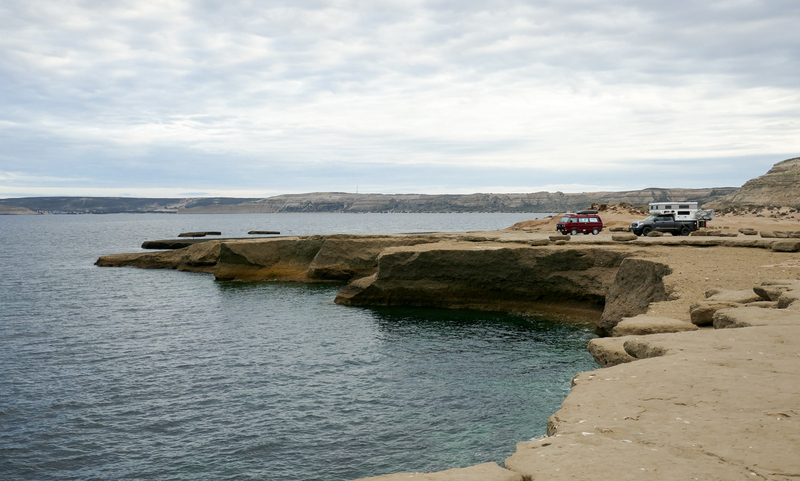 We kayaked in Golfo Nuevo, one of two gulfs surrounding Península Valdés. The gulfs are relatively shallow and protected, providing good conditions for Southern Right Whales to breed and raise their babies. 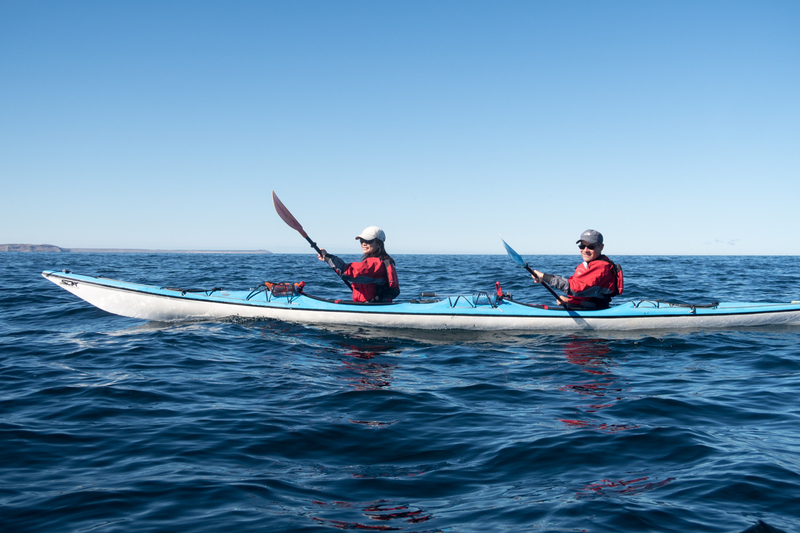 After only about 15 minutes of paddling we saw our first mother whale and calf about 30 metres away. With little wind and no motorized boats around us, we could hear them surfacing and blowing air through their breathing holes. 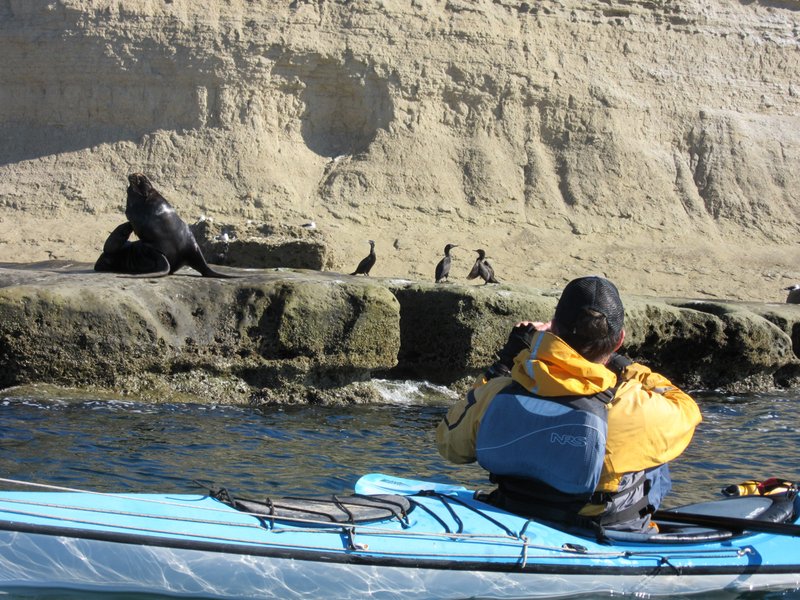 It was really amazing to paddle among these gentle creatures. 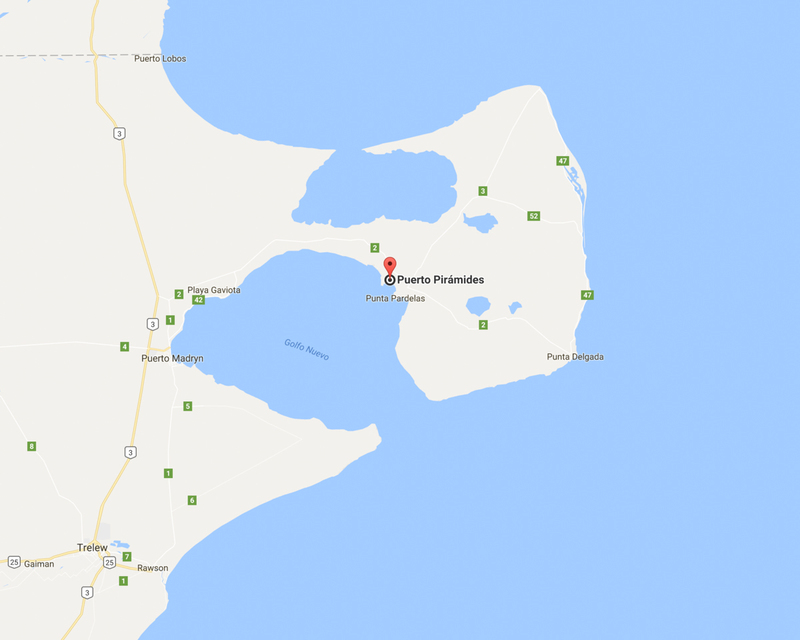 That night, we wild camped along the coast about 20 km drive from Puerto Pirámides. 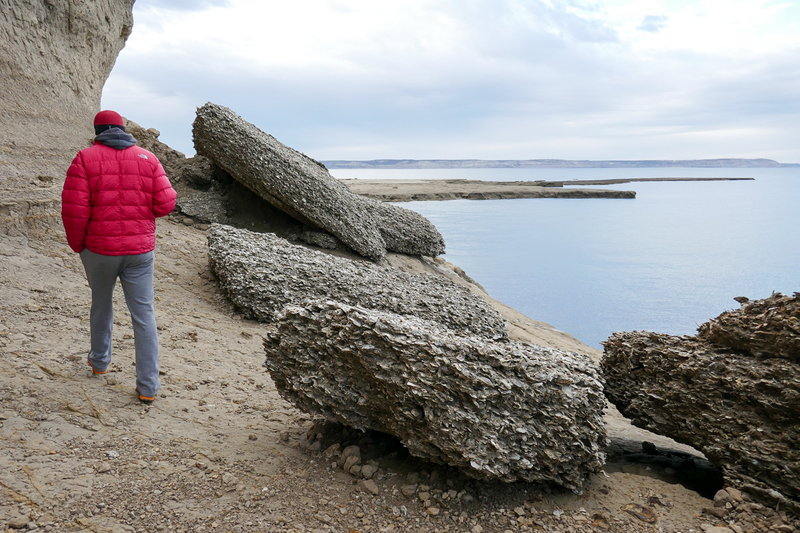 The shore was lined with cliffs and boulders that appeared to be made of sand. 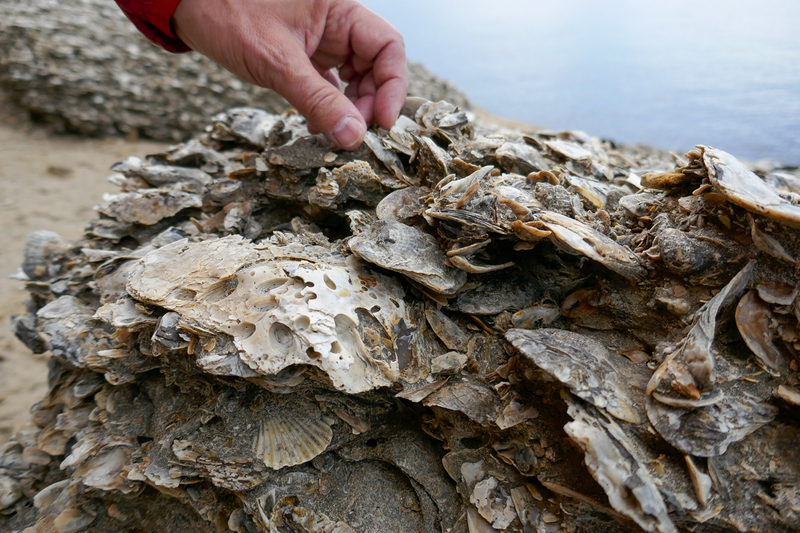 When we looked at the rocks up close, we realized that they were made of seashells. 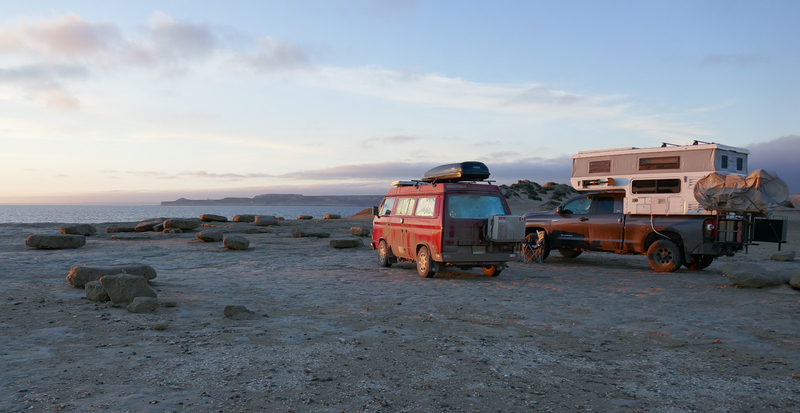 Overnight the wind from the coast blew so hard and the van rocked so much that we couldn’t get a full night’s sleep. Gregor was scared that our Thule roof box would fly away. I was scared that we’d be blown over the cliff. 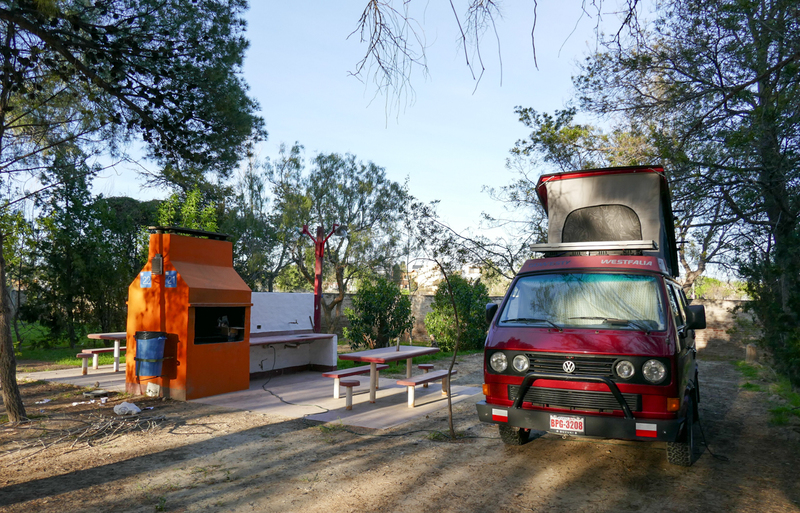 We could hear John and Paula’s bike covers flapping violently in the wind and I thought for sure that LoJo’s pop-up canvas would be ripped off the camper. The next morning everything was intact and the wind had died completely. 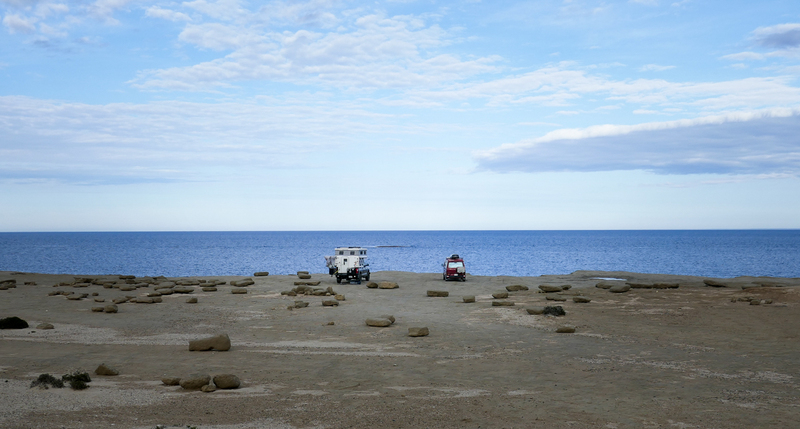 In fact, it was so calm that we could hear whales breathing from our campsite. 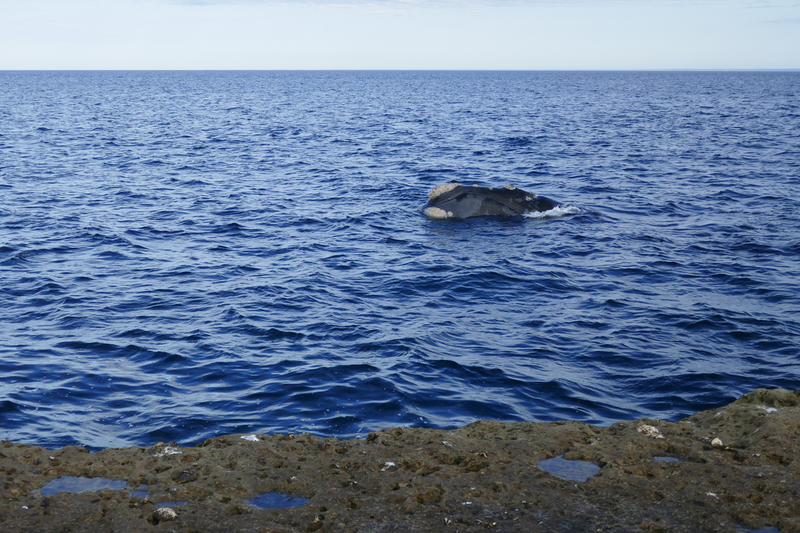 The whales came so close to us – we saw one swimming only 10 metres from shore! Absolutely breathtaking. 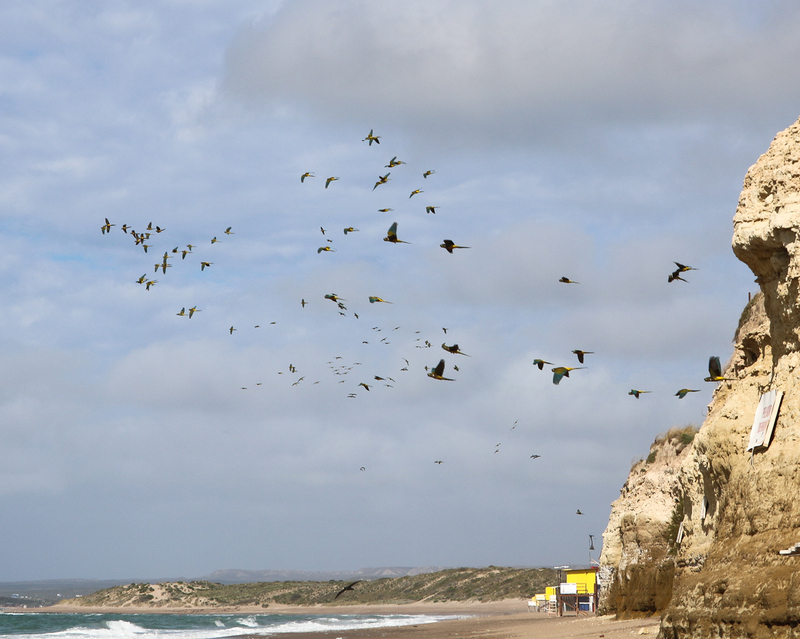 Sea gulls often peck at the Southern Right Whales when they surface, feeding off the whale skin and blubber. Our guide told us that this behaviour is escalating and it’s causing the whales to avoid surfacing for long periods. When they do surface, their white scars are very noticeable. 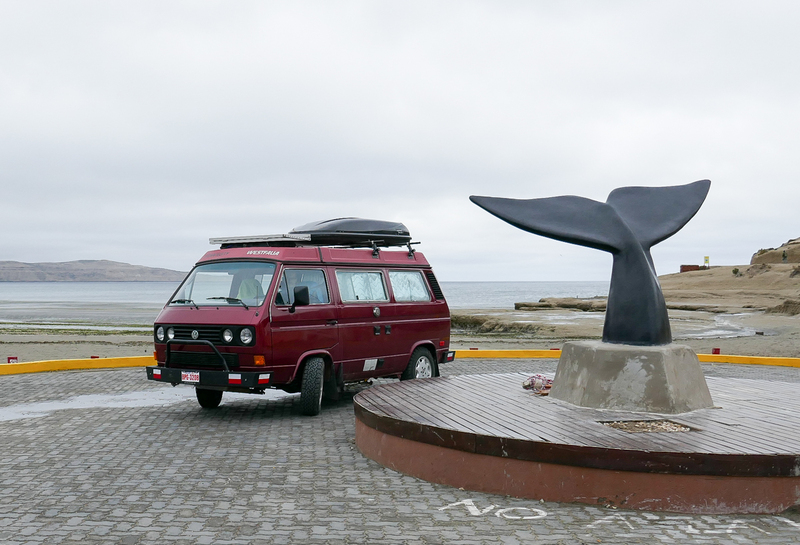 During our last day on Península Valdés, we drove around the nature reserve in search of penguins. 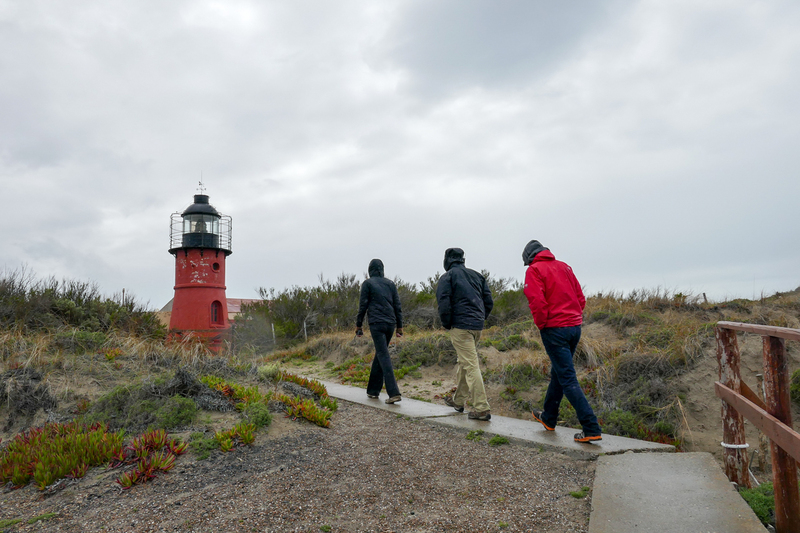 It was a miserable day – rainy, windy, and cold. 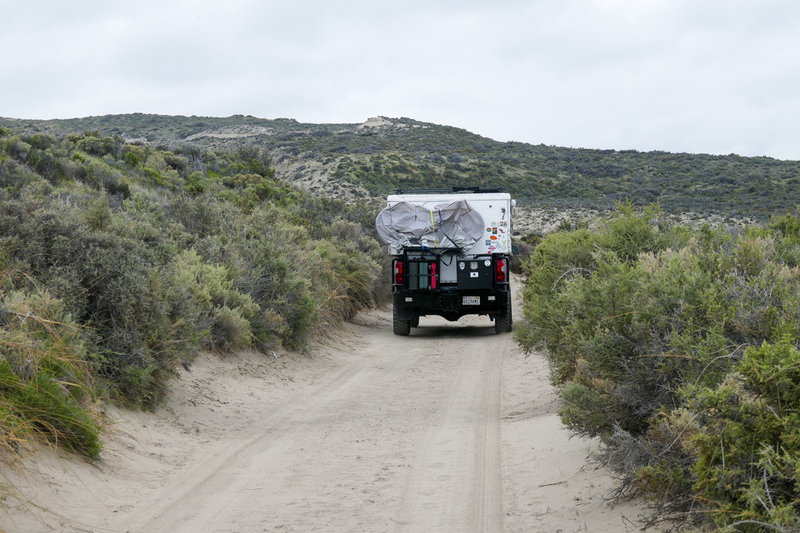 We made a few stops at designated viewpoints, reluctantly leaving the shelter of our vehicles and stepping into the rain to watch the wildlife on the shore. Their belching noises are kind of funny and disgusting at the same time. 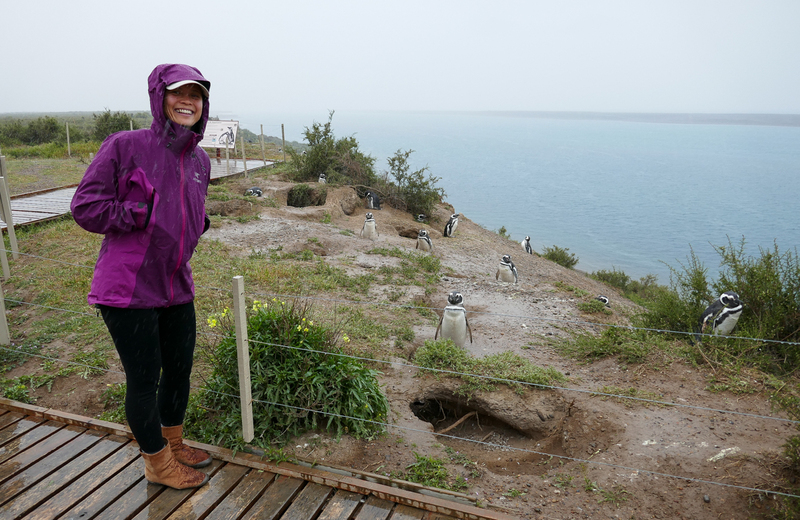 When I saw my first Magellanic penguin, I was so enchanted that Gregor literally had to drag me out of the rain and into the van so that my camera wouldn’t get soaked. The penguins looked so adorable waddling in and out of their burrows. 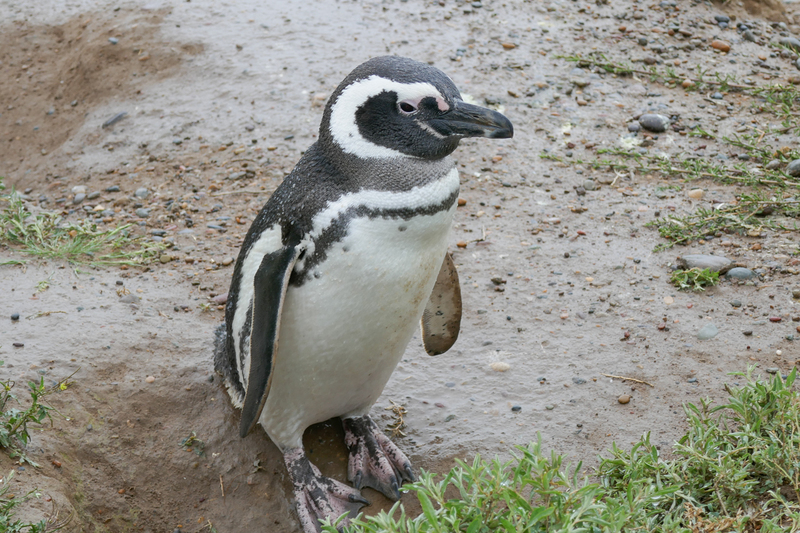 We later learned that Magellanic penguins dig burrows so that they have a safe place to incubate their eggs and raise their chicks. Mama and Papa penguin take turns incubating the eggs every 10 days or so. 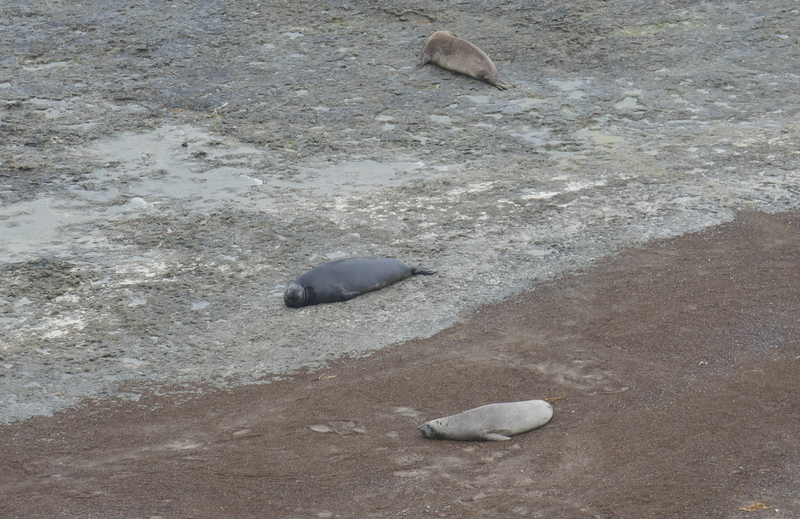 The non-incubating parent goes to sea to feed because they don’t eat while on incubation duty. 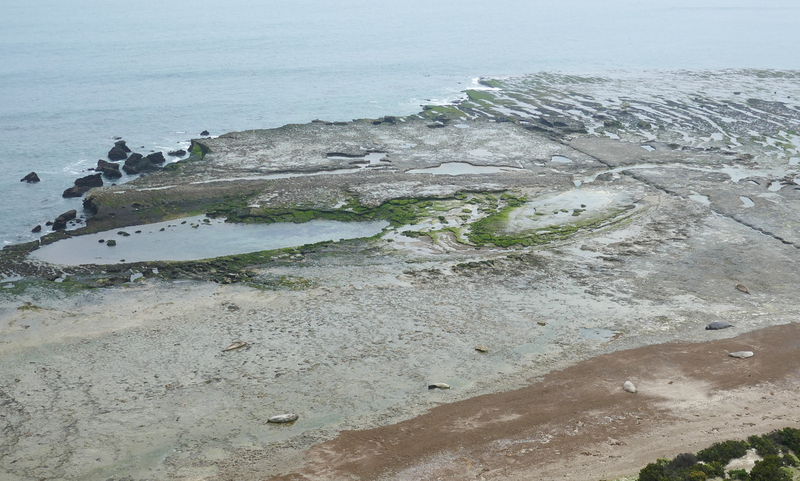 Since penguins can’t fly, they have to climb up and down these steep cliffs to feed themselves and the chicks. 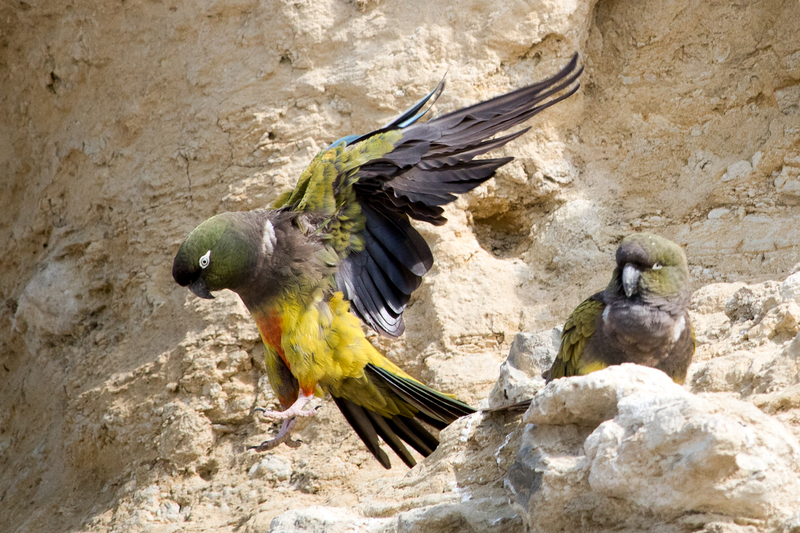 The things that animals do for their kids…it’s mind-boggling. Anyone who knows me will know that I was never really an “animal person”. I’ve never had a pet, I’m frightened of big stray dogs, and I don’t like visiting zoos. But when I see wild animals in their natural environment doing “natural” things, I feel in complete awe. 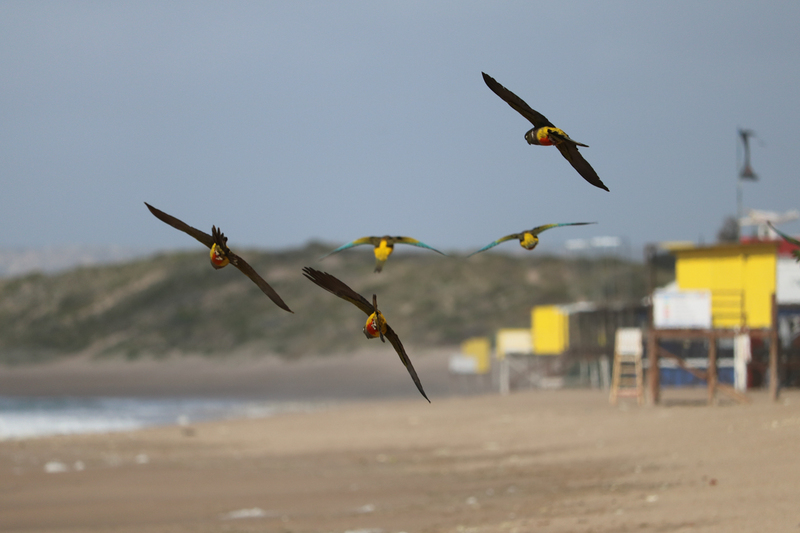 The three days that we spent on Península Valdés was a spectacular glimpse into the natural world. I hope to never forget that sense of awe when we return back to Canada. 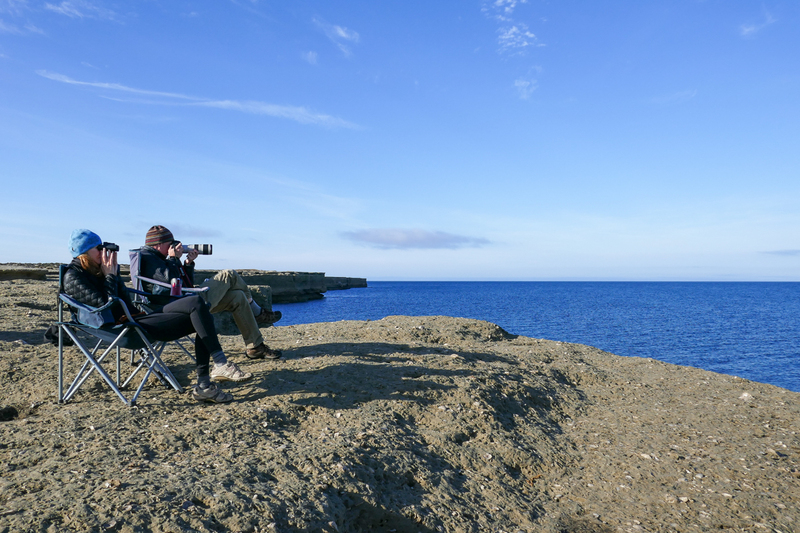 Our next wildlife watching adventure: the Atlantic penguin colonies at Punta Tombo and Cabo Dos Bahias, Argentina. Stay tuned! Janice, I love the expression on your face as you are posing with those penguins! Cheryl and I think we’ve never seen you smile like that. Please tell me you didn’t “adopt” a penguin! If it wasn’t so morally wrong to kidnap animals, we would have definitely had a penguin mascot in the van. 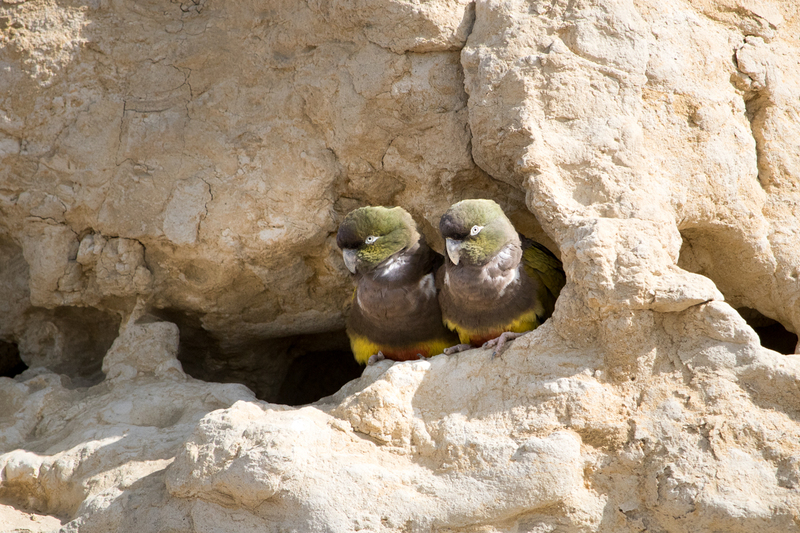 They are irresistibly cute! 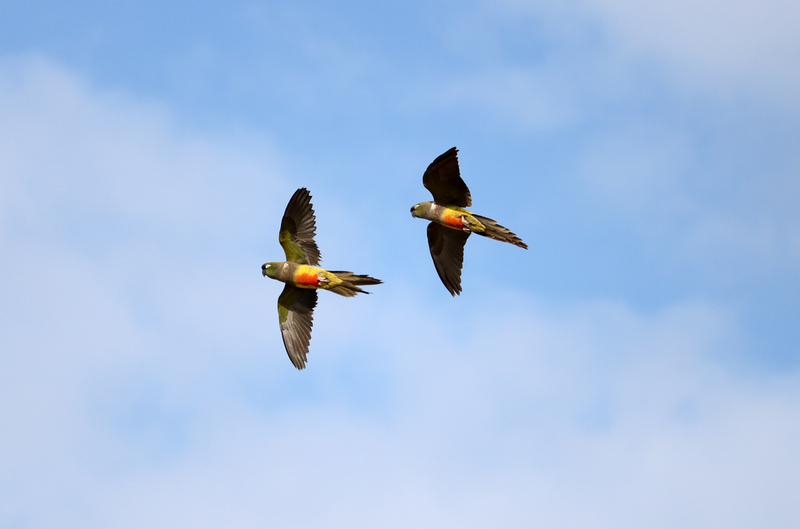 love, love, love the parrots. best trip to buy bread ever!! Such a great time camping with you guys there. hugs!! Love all of the pictures of the parrots, penguins and whales. What an experience! We had fun photographing all the animals. I wish we could teleport you to see them in person. Alex would definitely get a kick out of the penguins! Great read as always. I miss the sound of whales surfacing. It’s something you’ll never forget once you hear it. Those whales reminded me that there’s an underwater world that we just don’t see. We were very blessed to be able to see and hear them at such close range.